Unilever voted by employees as best place to work for fourth year in succession. 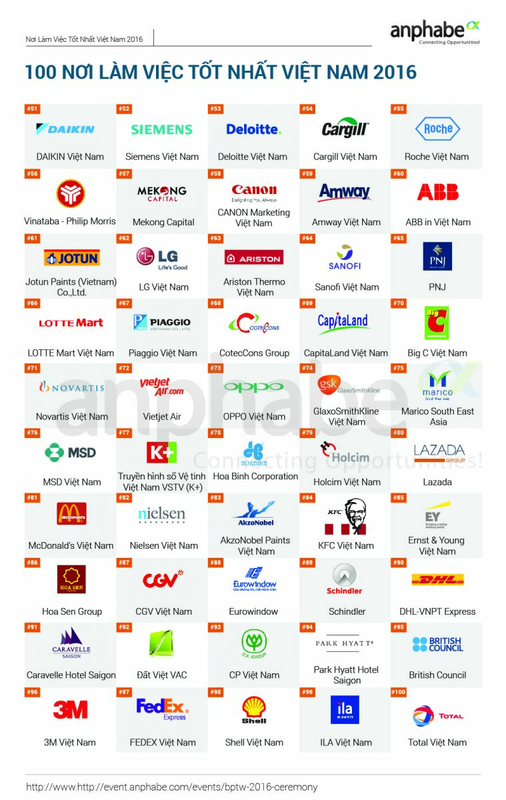 The 100 Vietnam Best Places to Work 2016 list was released by Anphabe on March 22. Unilever was again voted by its employees as the best place to work, for the fourth time in a row. Awards were presented to Prudential Vietnam in the Insurance industry, Mercedes-Benz Vietnam in Automotive / Auto Parts, Abbott in Pharmaceutical / Biotechnology / Healthcare, and Viettel in Information Technology / Telecoms. In Most Attractive Employer Brand, Vinamilk was again selected as the Most Attractive Employer Brand in Salary, Rewards, and Benefits and also in Opportunity for Growth and Leadership & Management. In Culture & Environment, Intel Vietnam was the leading Employer Brand. Nestle was chosen as the Most Attractive Employer Brand in both Work-Life Balance and Organization Reputation. Most companies now have three generations of employees working together: Baby Boomers (born from 1950-1969), Gen X (1970-1985), and Gen Y (1986-2000). According to the survey, the generation gap will present many challenges for businesses. For example, 41 per cent of Gen Y employees feel “unhappy”, with a happy employee being defined by Anphabe as someone who has both emotional and rational engagement with the business and so will willingly expend effort on helping the business be successful. Ninety-seven per cent of businesses interviewed by Anphabe think that within the next three to four years it will get harder for them to connect with and satisfy young talent. The Most Attractive Employer Brands for Gen Y, according to the survey, were Unilever, Nestle, Vinamilk, Viettel, and Suntory PepsiCo. The survey results are based on quantitative research of the largest scale for four years, which received feedback from 26,128 participants from the three generations in 24 industries. Ranking and evaluation processes received consultation and verification by market researcher Nielsen Vietnam.